One of the greatest icons modern history has known, Nelson Mandela passed away peacefully at his Johannesburg home on Thursday, 5th December. There have been very few men who have inspired the world at large like Mandela did, and he leaves behind his legacy, built by the tenets of humanity, equality, justice and non-violence during an amazing lifetime which changed the face of South Africa, a nation bound by the repulsive Apartheid system for decades. 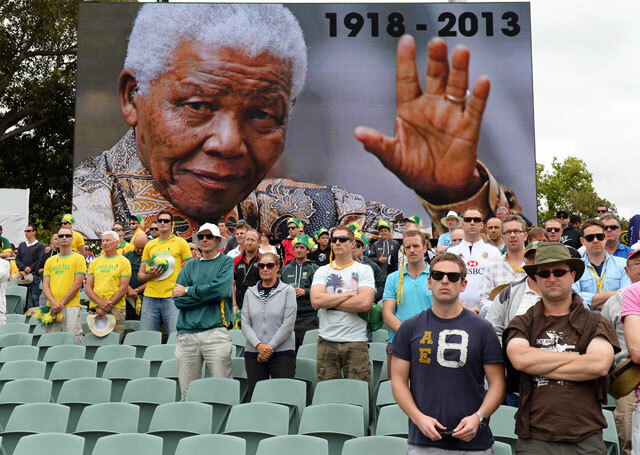 Naturally, Mandela’s influence was bound to be felt in the sporting arena as well. One of the most poignant moments in sporting history came when ‘Madiba’ presented the 1995 Rugby World Cup trophy to the Springboks captain Francois Pienaar after the home side defeated New Zealand in the final at Ellis Park. Then President of South Africa, Mandela, wearing a Springbok rugby shirt and cricket cap, proved that sport is indeed powerful in breaking racial barriers. Rugby was for a long time loathed by non-whites because of the white dominance, and the message sent out by South Africa that day in 1995 to the entire world was a lot more than merely celebrating a World Cup victory. When it comes to cricket, Mandela had no less an important role to play than he had in rugby. He was known to be a keen follower of the game – he famously asked former Australian Prime Minister Malcolm Fraser whether Don Bradman was still alive when the latter had come to visit Mandela in prison in 1986, the 22nd of his 27 years of captivity. Once he had revealed that he and his fellow non-whites used to support visiting teams in South Africa. “I watched a Test at Durban. We black people were not allowed to sit with the public. Instead, we were put in a barbed-wire cage. South Africa was winning and we black people were sad. But then came an Australian batsman who hit a century to win the match for Australia and we went home singing”, he recalled after he was released from prison in 1991. Nevertheless, South African cricket desperately needed Mandela when it was yearning for a return to the international arena. Having been isolated by the ICC since 1970 due to its shameful policy of playing with only white players, South Africa’s cricket fraternity had lost a lot during its two-decade long exile. Eventually, South Africa made a historic return to international cricket, playing a one-day match against India at Kolkata. However, they were not supposed to be participating in the 1992 World Cup, until one comment from Mandela paved the way for that too. According to Dr. Ali Bacher, the former South African cricket head who played a major role in bringing back his team into international cricket, a journalist once asked Mandela, after a meeting he had with Bacher and Clive Lloyd, of his views on whether South Africa should play in the World Cup. ‘Of course, we must play’, came the reply from the great man. That one utterance did it. Word was spread by Sri Lanka Cricket president Tyronne Fernando, who heard of the comment, and the various cricket boards agreed by majority that South Africa should be the ninth team in the 1992 World Cup. The Proteas went on to reach the semi-finals before a ludicrous rain-rule knocked them out. A month after the World Cup, South Africa played their first Test after readmission, fittingly against the West Indies at Bridgetown. Gerald Majola, then CEO of the South African cricket board, credits Mandela for playing a huge part in cricket’s return to South Africa. “It was his endorsement of the unity process and the formation of the United Cricket Board that showed the world South Africa was now acceptable following the apartheid years”, he once recalled. Indeed, it was Mandela’s influence that persuaded ICC members and their governments such as India, Pakistan, and the West Indies to agree to the UCB being admitted as a member of the ICC. 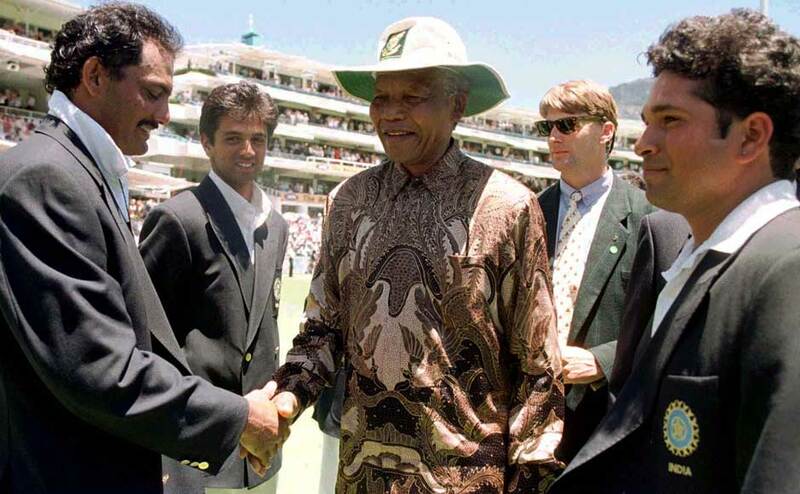 Madiba also made sure that he was publicly present when India toured South Africa in the 1992-93 season in what came to be known as the path-breaking ‘Friendship Tour’. Majola added that Mandela turned up at India’s warm-up match at the Oppenheimer Oval in Midrand while on his way to Pretoria to register the African National Congress as a party to contest the elections. As it happened, South Africa’s first home series since readmission resulted in an instant success for them on the field as well. The Proteas defeated India 1-0 in the four-Test series and 5-2 in the seven-match ODI series. The tour is also remembered for the introduction of the ICC panel of independent umpires and the decision of the UCB to experiment with TV replays to settle difficult line decisions – an innovation that created the third umpire. In the first Test at Durban, the South African eleven included a non-white – 40 year-old Omar Henry – for the very first time, and it signalled the arrival of the true meaning of democracy in the cricketing set-up. 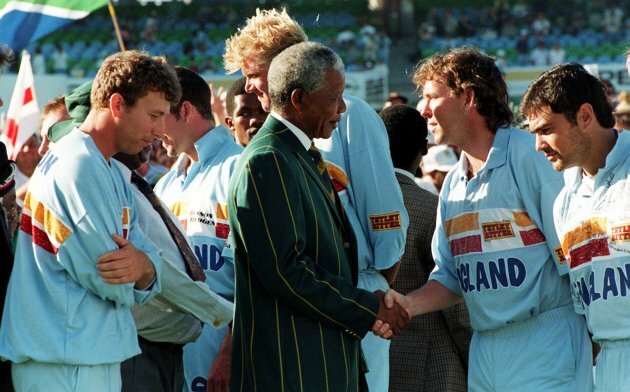 Mandela, in 1995-96, delighted all and sundry by turning up in full cricketing attire: long whites, cream shirt and a Proteas cricket blazer at St Georges Park in Port Elizabeth during England’s visit to support his team. The days of rooting for the visiting team were long gone and Mandela’s philosophy had firmly become rooted in South African society. When South Africa hosted the cricket World Cup for the first time in 2003, he came for a press conference wearing the green Proteas jersey. Being a boxer in his early days, he knew of the significance of sport in changing mindsets, and he used sport as a platform to signify the new-found power of a united South Africa. As it happened, Mandela breathed his last while the opening ODI between South Africa and India was being played out at the Wanderers, passing away peacefully in the knowledge of the massive contribution he had made to the world of sport. It would thus indeed be perfectly appropriate that Test series played between South Africa and India in the future be named after this great leader. Mandela’s own inspiration was that other historical great Mahatma Gandhi, who advocated the same principles during the freedom struggle in India. Co-incidentally, India were South Africa’s first opponents after Mandela’s release from prison, and also their opponents on the day he was released and set free into eternity. Initiating the Nelson Mandela Trophy for the India-South Africa Test series of four Tests each would be a prestigious thing to do, and an apt gesture to man who probably defined modern-day history. May the soul of South Africa’s greatest son rest in peace, and may his legacy be kept alive forever.